The first Māori people brought their art and crafts with them from their ancient homeland in Polynesia when they migrated to New Zealand more than 1000 years ago. In their new, remote home in the South Pacific, away from outside influences and with different materials, they developed these craft over successive generations. Wood carving was the primary art form but it was just one of the Māori's cultural accomplishments. Māori art ranged from carving meeting houses and other buildings, war canoes and weapons - to creating clothing and personal ornaments such as burial chests, musical instruments, treasure boxes, marvellous cloaks and skirts. Almost nothing that the Māori made was without decoration of some sort. They used a wide variety of materials, from readily available and workable timber, flax, bone and whale-bone ivory to the less tractable greenstone, argillite and basalt. They practised and experimented with a range of styles from formalisation through impressionism to the near-abstract. Generally speaking, Māori art was and still is, largely a question of shape and design rather than colour. Traditional Māori arts flourish today although new materials, tools and international influences have introduced an added new dimension to traditional design. For other issues on Maori see our Maori Page & Index. 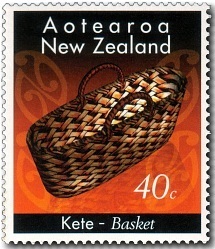 40c - Kete / Woven Basket. Māori women wove baskets for everyday use and little time was spent on ornamentation - although trouble was taken with the small baskets made to hold valuable objects. The more elaborate kits with woven geometric patterns are a modern innovation. The various types of basket were woven from flax or durable cabbage tree leaves. Flax leaves were dried over a fire so they would not shrink. Baskets were neatly finished by turning them inside out so protruding ends would not show. Plaited loop handles were fastened to the sides. The kete is a utilitarian carry-all which comes in a wide variety of shapes and sizes. 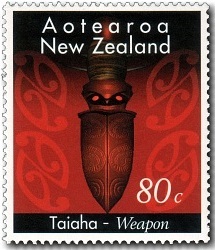 80c - Taiaha / Two-Handed Wooden Weapon. Before the Europeans arrived in New Zealand, bringing guns with them, Māori warriors fought hand to hand, either in skirmishes or in pitched battle. Necessarily they developed a wide range of personal weapons for combat. Approaching two metres in length the taiaha was made of hardwood with a carved head and pointed tongue (the carved head is illustrated on the stamp). The weapon was used much like a quarter-staff or two-handed sword. 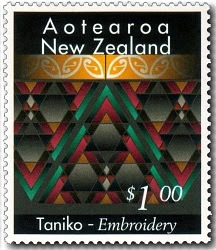 $1.00 - Taniko / Geometric Embroidery Patterns. The geometric patterns of taniko feature coloured triangles, zigzags, and other rectilinear elements combining to form a unique series of patterns. This intricate craft is chiefly used to decorate clothing. The handcraft encompassed weaving and hand-dyed fibres. 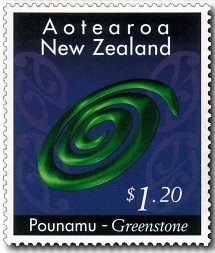 $1.20 - Pounamu / Jade or Greenstone Sculpture. Greenstone or jade, found mainly on the west coast of the South Island, was an important barter item in the Māori economy. It occurs in colour variations from black through green to milky white. Blocks of the material were broken down and transformed by laborious cutting and grinding into personal items of great beauty and value. Modern tools and methods have enabled craft workers to produce a wider range of designs and shapes. $1.50 - Hue / Decorated Gourd Container. 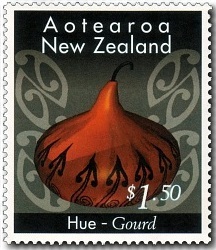 The dried fruits of the gourd plant, brought to New Zealand from the ancestral homeland of the Māori, were put to a wide range of everyday uses from water bottles to storage containers. The soft inner material was removed to leave the hard rind or outer skin. Wooden mouthpieces or spouts were frequently added. Many gourds were decorated by scratching or incising the outer surface. This example has curved patterns of the koru type. The koru features on the background of five of these stamps and is incorporated in the taniko pattern on the $1.00 value. 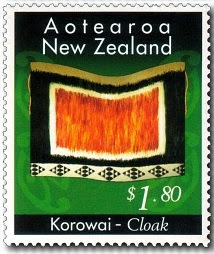 $1.80 - Korowai / Woven Feather Cloak. Māori women were the expert weavers and their superb sense of style and decoration reached great heights in the production of clothing, especially cloaks. Among them were feather-decorated cloaks, mourning cloaks, ceremonial cloaks and finely woven cloaks with coloured borders or taniko. Most garments had a woven flax base. Superior cloaks were works of art and much time was devoted to their production. Cloaks featuring kiwi feathers and the brilliant red feathers of the underwings of the kaka were particularly prized. 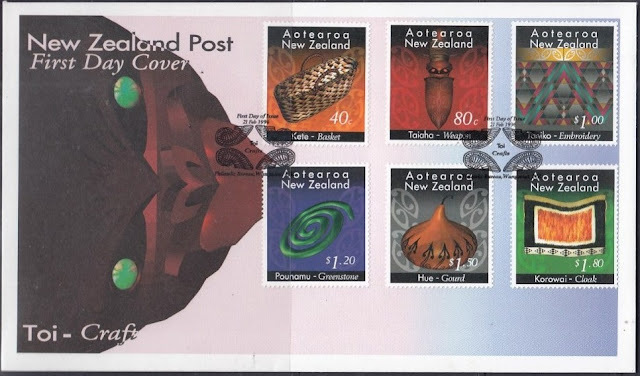 First Day Cover - 21 February 1996. 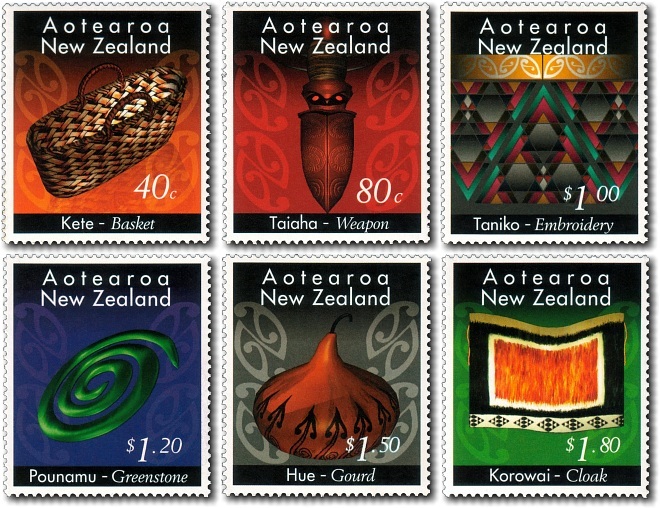 These stamps remained on sale until 21 February 1997.